At Rock With Us, we go beyond your expectations and we stand behind our work. 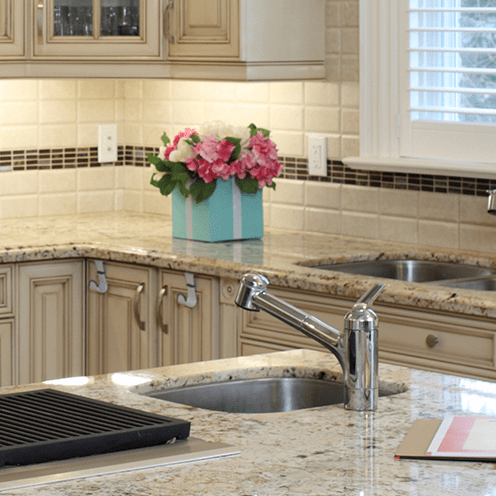 We stock the largest selection of quartz and granite in Southern Ontario to fit all of your needs. Whether remodeling your current space, or building a brand new dream kitchen, our experienced staff will assist you in finding the right material for your project. See our assortment of different types of marble stones. View our collection of granite countertop colours and styles. Check out our selection of granite colours and styles. View our wide variety of quartz colors and styles. Interested in granite, quartz or solid surface bathroom and kitchen countertops? We have a huge selection available. All product images represent live inventory we have on hand. No stock images used. Rock With Us has built its reputation on gorgeous granite and quartz countertops and incredible craftsmanship. We know how important it is to have the job done right and in a timely fashion. Why should you rock with us? We strive to ensure our client’s satisfaction from start to finish by guiding them through the process and adhering to the highest standards of quality and craftsmanship. Very pleased with the outcome of our bathrooms and the beautiful full wall piece behind our fireplace . Very professional staff and special mention to Scott. Job well done!